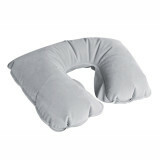 Boots Inflatable Travel Pillow, designed to stop the head lolling back or to the side uncomfortably when napping or sleeping in transit. The pillow deflates to take up less room when not being used, to make it even more useful to weary and suitcase-constrained travellers. The pillow is made of faux-suede fabric that is comfortable and maintains a neutral temperature at all times. These travel pillows can take the pain out of long journeys, supporting the head and neck of weary passengers in either cars or aeroplanes. Nearly everyone has experienced the pain and stiffness that can accompany lengthy journeys during which waking up from what should be a refreshing nap turns into a time of pain and discomfort! One of our gentlemen was off to a three-day music festival and hoped to spend the lengthy bus ride there catching up on his sleep in order to party as hard as possible once at the venue! Therefore, he eagerly snaffled the chance to try out the Boots Travel Pillow and tucked it into his backpack. About an hour into the bus journey, he remembered the pillow and opened it up, inflating it in a few seconds. He felt a little self-conscious putting it around his neck, but soon fell asleep, only waking when the coach was a mere half-an-hour away from his destination. To his delight, he had slept heavily and comfortably, and his neck was painless and free from tension and knots. He deflated the pillow and tucked it away, not giving it another thought for the duration of what turned out to be a thoroughly enjoyable event. Hopping into the return coach to head home, he was filthy and exhausted, but happy. Desperate to begin catching up on his missed sleep, he pulled out the travel pillow, inflated it and snuggled up against the window.